Friday the 2nd November is a traditional Mexican festival where people remember and honour their loved ones that have passed. I didn’t even know about this celebration until earlier this year when I went to watch the most beautiful film, Coco with the children. 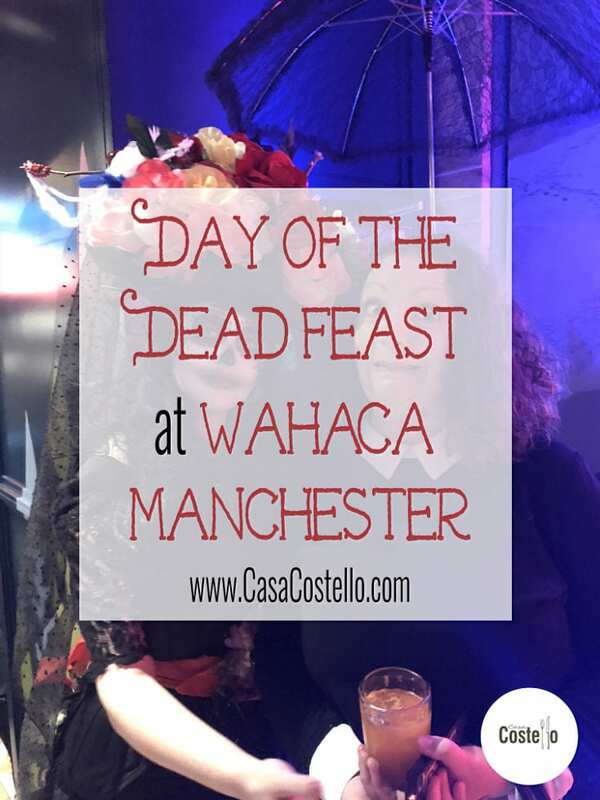 I was invited on Friday to celebrate the Day of the Dead (otherwise known as Dia de Meurtos) at Wahaca in Manchester. Wahaca is a chain of Mexican restaurants, co-founded by Masterchef 2005 winner, Thomasina Myers. 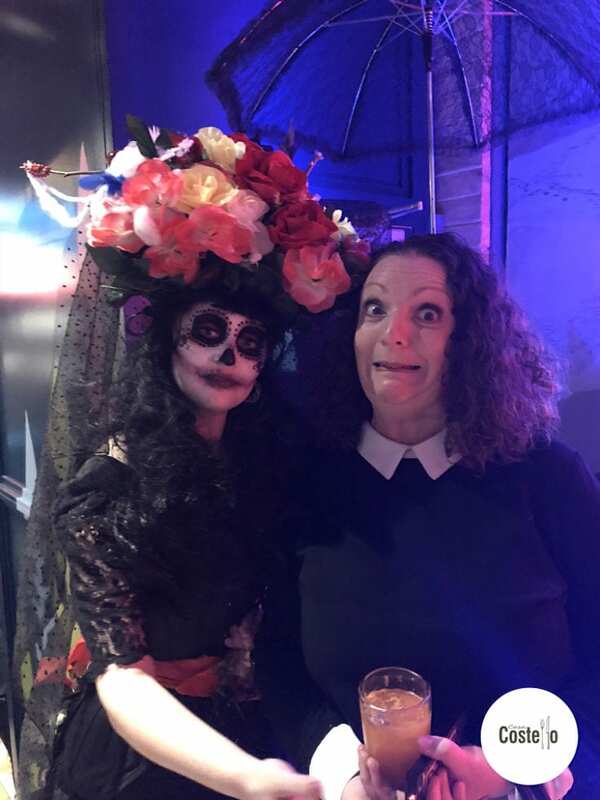 Thomasina hosted 2 Day of the Dead events last week with a 5 course feast amongst a host of entertainment at the Manchester and London restaurants. Wahaca Manchester is based in the Corn Exchange where several other restaurants are also based. Just a short walk from Victoria train station and Manchester Arena, the location is central and popular. 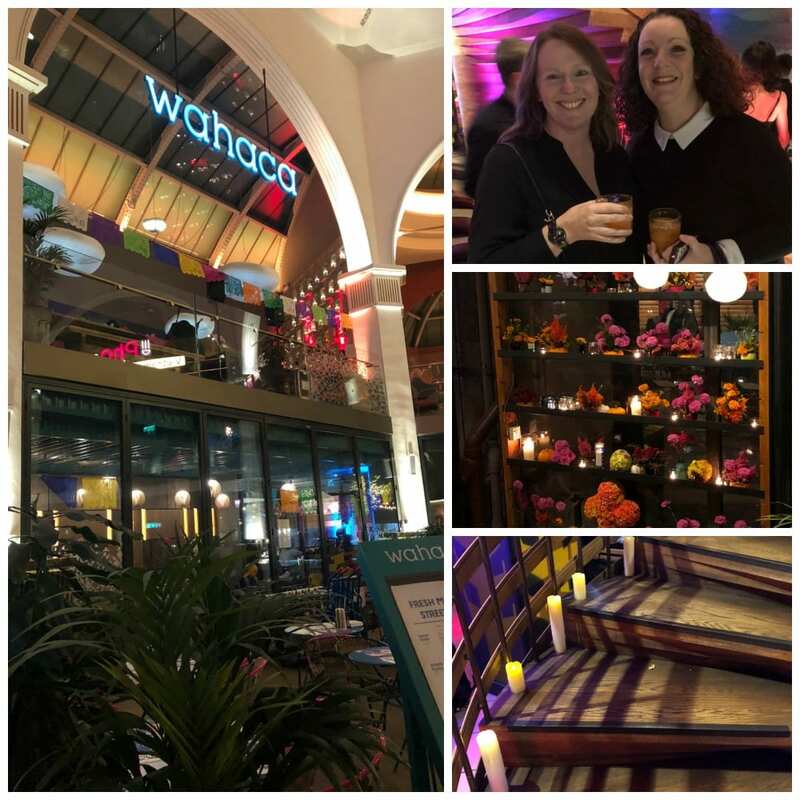 There was a real buzz on Friday evening around the area – no other restaurants seemed to be having as much fun as at Wahaca though! The Day of the Dead team had gone to town on decorating the restaurant. There were candles, flowers, masks, bunting everywhere. Even an ‘altar’ where we were invited to remember our dead. We were greeted by a ‘dead man’ lying on the stairs and 2 actresses who made incredible dead people. Oh so spooky though – They moved about throughout the restaurant during our meal and were super sports in stopping for photos. And so onto the actual meal. A 5 course dinner, cooked by Thomasina Myers. Sadly Thomasina didn’t make an appearance which was fairly disappointing but hey, we enjoyed the evening regardless. She missed out on meeting us! Our first course was my ultimate favourite and a dish that I would eat again for days on end. A Mexican City passion fruit ceviche – Three citrus, passion fruit, avocado & rainbow trout. So fresh and zesty. The trout was incredible – just falling apart due to the citrus. I didn’t really get the passion fruit coming through but this dish was so tasty it definitely wasn’t missing anything. There was quite a lot of coriander as you can see from the picture but happily I love fresh coriander! The 2 nacho crisps were a fun addition too. 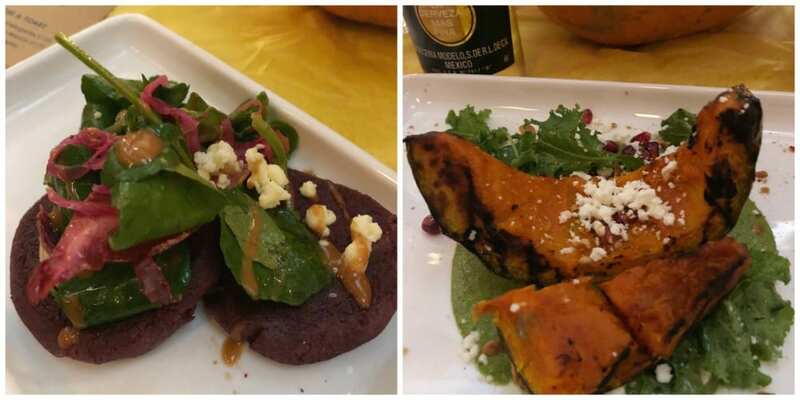 The 2nd and 3rd courses were both vegetarian. The Gordita (Blue corn massa) with hibiscus flowers, pink chicory & quest fresco was super pretty – I was glad to be able to remove the light dusting of cheese being a cheese hater. The Riverford Organix squash with cashew nut mole & hazelnut was again, very striking. I have to admit though, for both courses I felt slightly underwhelmed by the flavours. We were both starving so had no trouble finishing both courses but felt there was something slightly lacking in taste. Both the Corn patties and the squash had similar textures and felt quite claggy to eat. Whether it was my mind playing tricks by expecting the bright green cashew puree to taste like pea puree, I’m not sure. Still both harmless dishes, beautiful to look at and wonderfully fresh ingredients. 4th course was a simple enough dish – warm & hearty. I know I’m a grown up but I still have issues around eating rabbit but gave this a go anyway. Partridge & Rabbit Picadillo (a bit like a ragu/stew) with wild rice and a chargrilled Ancho Chilli tempura on top. Neither of us enjoyed the chilli pepper but the ragu was comforting and disappeared in no time. Our meal ended with an incredible dessert – Vanilla & Citrus Tres Leche, eaten with the most bizarre plastic spoon. 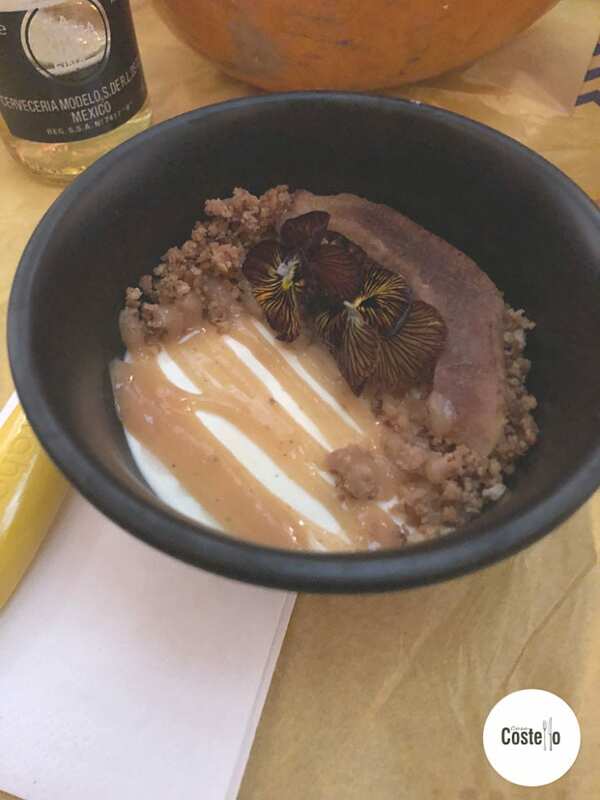 The spoon is apparently a signature of Wahaca, it looks and feels a bit like a baby spoon but oddly it really works and makes the experience of eating the dessert even more enjoyable. 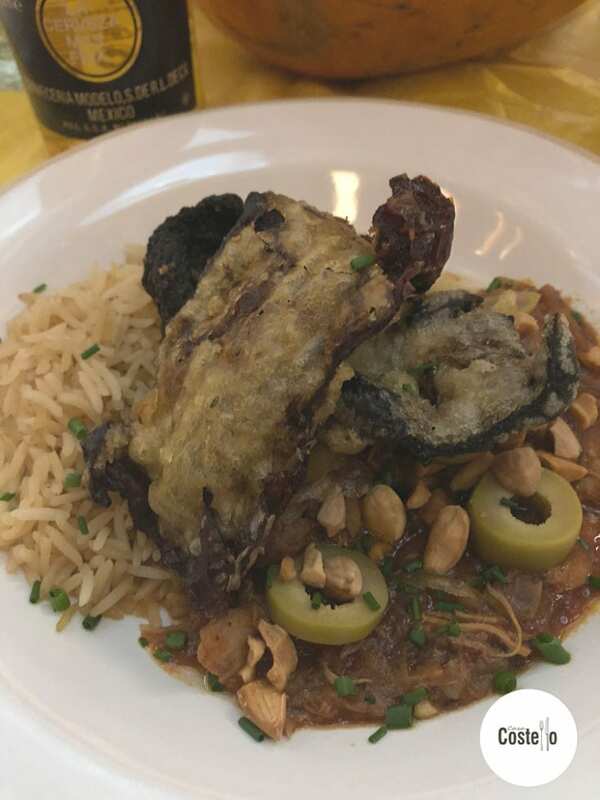 Wahaca certainly didn’t scrimp on portion size – This was a huge dish but so delicious we ate every last bit. At this point I want to tell you about our waitresses for the evening. 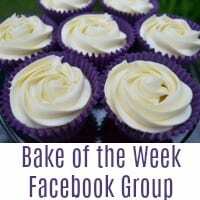 They were fantastic – offered knowledge about the dishes and could answer any questions we threw at them. Thank you so much for looking after us! 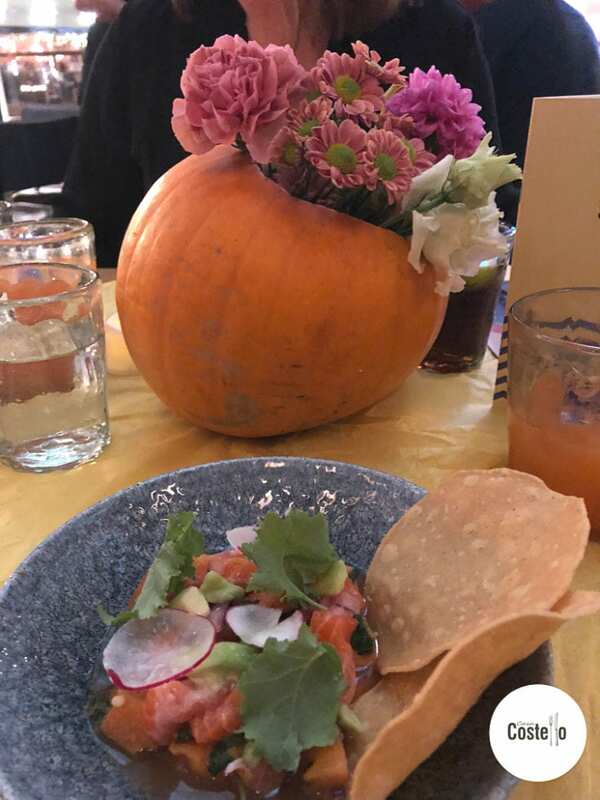 We were invited to Wahaca and given this meal in exchange for a fair and honest review. Wahaca, Manchester can be found at The Corn Exchange, Exchange Square, Manchester M4 3TR. 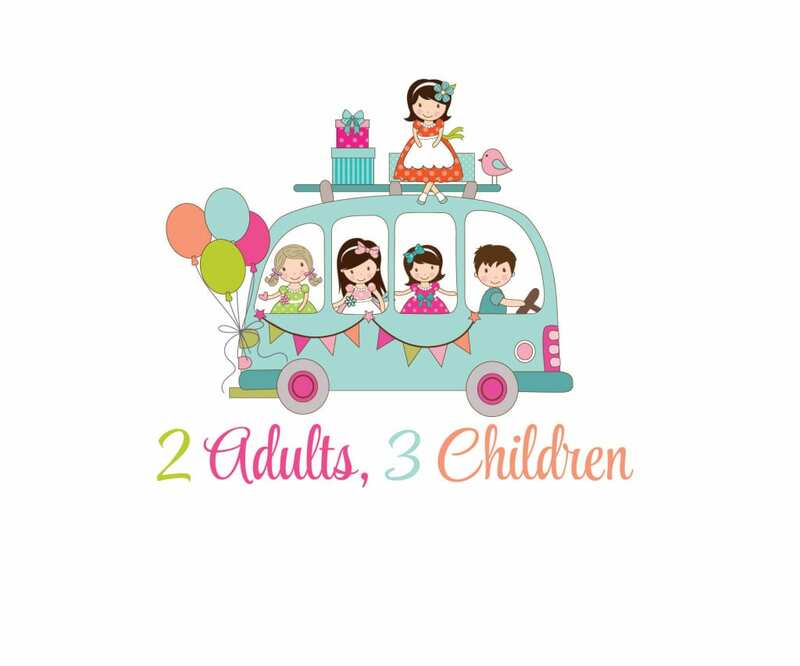 Visit the website here for bookings and more information. That looks like it was so much fun! I wish I could have been there to take part. It was a really fun night! I’ll be looking out for a Day of the Dead celebration next year. This looks like such a wonderful celebration! I love your photos. Hope you had an amazing time. Thanks – we did have an amazing time. It had a real celebratory feel to the evening. I grew up in San Antonio so, Day of the Dead is part of the culture there. It’s really cool to see how widespread it’s become and so many people celebrating it. Oh wow, I bet you have been to some fantastic Day of the Dead celebrations! Wow what an incredible experience to celebrate such an incredible day! That food looks to die for! It is an incredible idea for a day, isn’t it? I am gutted I missed this. It looks like a lot of fun and of course the food looks amazing. Aw I was hoping I might have seen you there as I know its not too far. Maybe next time! I have never been in this kind of celebration and but this one looks like a lot of fun and it seems like you are really enjoying everything most especially the food. Yes the whole event was just fantastic – Was so glad that we went! The movie Coco was very nice and I learned about the celebration too. 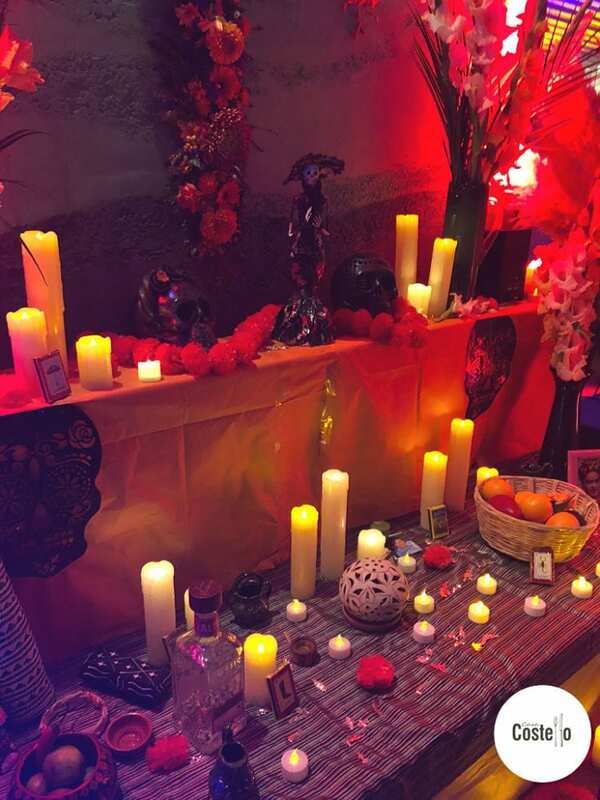 When I saw the altar photo, the first thing that really came to my mind was the movie Coco. Haha. Anyway, it seems you had really fun with the feast! Wish I was there and experience the celebration myself too. I think Coco might be one of my most favourite films ever! The restaurant had staged the celebration perfectly. I’m desperate to go to wahaca everyone raves about it! this night looks especially good, and lots of fun!!! I have heard great things about this but have not been myself. I think this could make for a very interesting evening. Wow, this looks like an amazing experience! THank you for sharing your beautiful photos. Oh wow, what an incredible experience! It looks like they went through a lot of time and effort to make this a super event – I’d love to go one day! I love all this attention to detail! Especially with the additional of actors to make it a completely immersive experience. 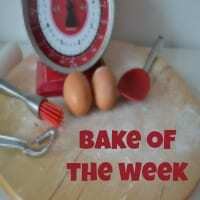 This looks fab! Everything from the food to the table decorations! The 5 course dinner meal look so interesting and well presented. I have never tried rabbit before but it would be very courages to try this dish. What a fun night! We are thinking about using this theme for Halloween next year. Every year, we host a fun Halloween dinner party. i’ve always wanted to participate in the day of the dead festival. Since the new Disney movie came out people are starting to understand the cultural aspects of it and not the name itself.. if that makes sense! This looked like such a fun experience! the food looked amazing as well! This looks like so much fun! What a great celebration! Wow, it certainly seems like you had a fabulous night out at this event.